An assassin is assigned to kill a Middle East oil minister. His cover is that he's producing a big trade show that includes a wedding between a local pop star and a politico, but complications ensue. 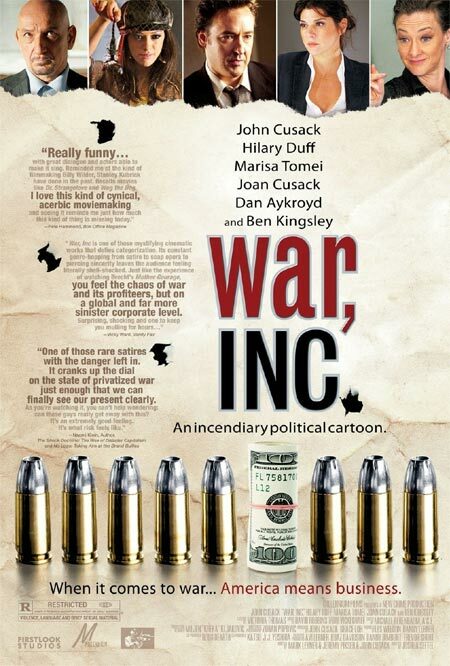 Movie reviews for War, Inc.
Crazy crazy movie. At first you really think this is a serious action movie, but then all the silliness starts. Then you think that it's a comedy, but then the drama starts. After that you are just plainly confused. I like all the genres, but in this weird mix-up you kind of loos track of what you think of the movie. Regarding the plot, there is an okay line to follow, and if you leave out all the silliness, it kind of makes sense also. The acting is pretty poor, but I guess some of it has to do with the strange dialogues and absurd actions of the characters. The soundtrack, special effects etc. is standard to good. All in all a good movie, if you would like to get confused/surprised every 15 minutes.